Long-term travel can be so mentally draining, especially when you’re forced, like I am, to stick to a very tight budget. Thus, every now and then you need little rewards. 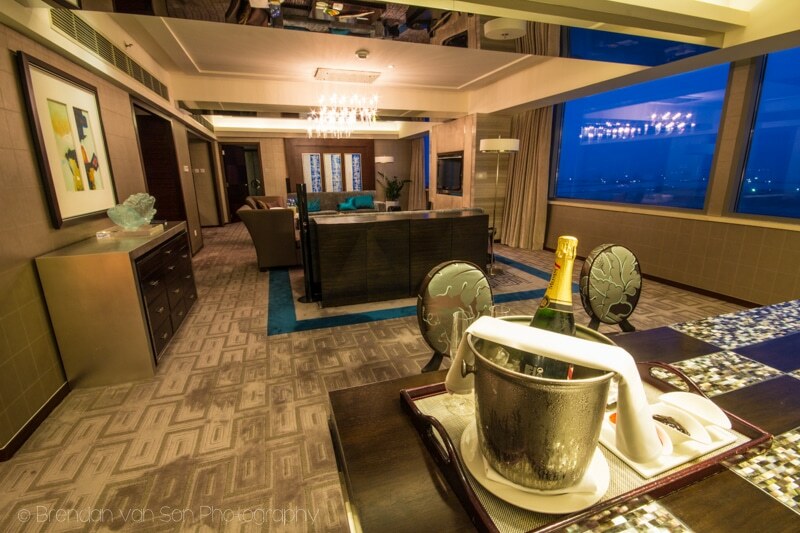 Or, as was the case on our 10-day visa chase in Hong Kong, a massive reward – a couple nights of pure luxury at the Marriott SkyCity staying in their vice-presidential suite. How is this for a room?? Before arriving in Hong Kong, we knew that we’d be treated well. Each and every Marriott property I’ve ever had the chance to stay with has been nothing but class. But I was blown away by not only the quality of the property, but the brilliant care we were given by the hotel and their staff that went out of their way to make sure our stay was easy, as well as comfortable. Upon arriving from Chiang Mai via Bangkok – which was a far longer day of travel than it should have been – we were met by the brilliant Marriott SkyCity staff with a vehicle waiting to whisk us away. Sure, the hotel is only a 10 minute walk from the terminals, but the service was so nice. Love this living space. I never wanted to leave. What we didn’t know before arriving at SkyCity for our 3 night stay, was that we’d been given a massive upgrade to the vice-presidential suite. I had to laugh at the constant change in style that you experience as a travel journalist. The night before, we were staying at a mediocre budget hotel in Chiang Mai for $20 a night. I mean, the breakfast buffet at the Marriott was worth more than our room was in Chiang Mai. And I mean “worth”, not “cost”, although both are true. At the Marriott our suite was equipped with an office, a kitchen, a master bedroom, a dinning area, television room, and 1 and a half bathrooms. I could have lived a happy life inside the vice-presidential suite, only ever leaving my room to feast on the food at the restaurants below. It was stunning too, with a perfect view out over the seafront. And as if the upgrade to the vice-presidential suite wasn’t enough, we were treated one evening to a tray of chocolate covered fruit, and a bottle of champagne. And the day we sadly had to leave, I fell into a perfect trance while being given a massage in their spa. Then, before catching the airport train to downtown Hong Kong, I’m not ashamed to say that I lost my manners while devouring what was an incredibly decadent high tea. Seriously, it was perfect, and there’s no other way to describe it. 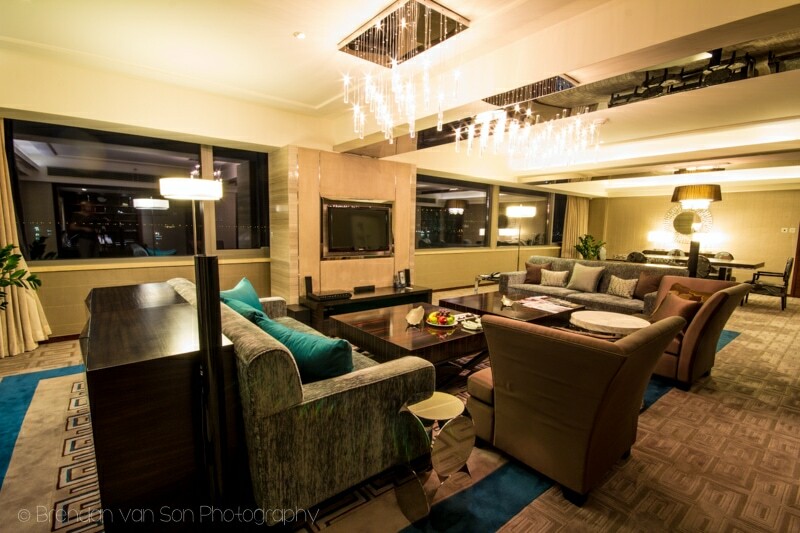 Is the Marriott SkyCity Hong Kong Right for You? I can figure on a number of people that this property really works for. Luxury Layover: Let’s say you’ve been in Hong Kong for a while and what to treat yourself before catching your early flight. 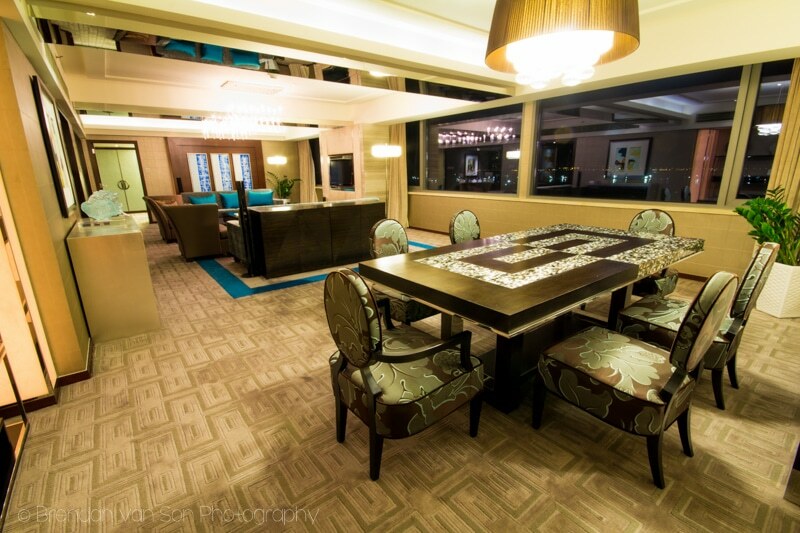 Maybe you have a layover in Hong Kong and want a bit of luxury. This is for you. Hong Kong Disneyland: If you’re a family planning on visiting Hong Kong Disneyland, you’re only a couple stops away at the Marriott SkyCity. Want a “Different” Hong Kong Experience: Out on this island, you’ll have a completely different experience than you would down on the island or in Kowloon. Moreover, there’s actually a lot more out near the airport than you’d imagine. The big buddha is out here. There are also a number of hiking trails through the hills on the island. Another great attribute to the Marriott SkyCity Hong Kong, and the whole Marriott brand for that matter, is that they are very social. If you have a question, shoot them a line on twitter and they’ll get right to you. Their facebook page is also great for a bit of wanderlusting! Um, amazing!! I’m getting married in October and secretly hoping that we’ll be upgraded to the presidential suite at the hotel we’ve booked at 🙂 Let’s hope we’re as lucky as you! I just put on the “Rocky” theme song and ran laps.